Collect and organize reading material. Provide reading and lending services to scholars, trainees and staff of the Academy. Support the training programs of the Academy. Da’wah Research Library earlier known as Da’wah Academy Library is primarily serving to the research scholars, academicians, and course participants of Da’wah Academy. Its doors also remain open for the researchers having their interest in Da’wah and Islamic studies. The Library has a rich collection of about 29,000 volumes of books and bound journals on various aspects of Islam in Urdu, Arabic, English and Persian languages. Important works on history of Pakistan, Quaid-i-Azam and Allama Dr. Muhammad Iqbal are also available. 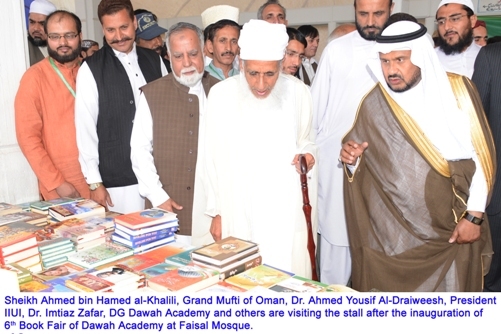 Library is receiving 52 periodicals on complementary basis in Urdu, Arabic and English languages. Three newspapers are on subscription list of the Library. This Library with a Senior Librarian, two para-professionals and three supporting staff is providing services from Monday to Friday during 08:00AM to 03:30 PM. In addition reading material for 02 constituent libraries i.e. Da’wah Public Library and Da’wah Centre for Women Library are purchased and processed in Da’wah Research Library and then sent to the constituent libraries for display, while bills for purchase of books in Regional Da’wah Centre (Sindh) Library, Karachi are also processed in the Da’wah Research library for payment to booksellers. Reference service plays a vital role in increasing user’s satisfaction. Through this service we are assisting our researchers in a more professional way. Library also providing reference services to all over the country’s researchers, scholars and students from various Universities. To facilitate the research scholars, a “Books Recommendation Form” has been introduced. Now our faculty may suggest their required books just using the prescribed form instead of writing note. There were no approved library rules for Da’wah Research Library. Library rules were formulated with the approval of worthy Director General, D.A. in 2011. Now library is following approved library rules. Earlier the periodicals were stored in the last cabin adjacent to the staff cabins. This place was hindrance in the proper use of these valuable resources. Now this section has been moved adjacent to the “Reference Section” to provide quick access to the library users. The Library has taken initiative to upgrade its automation using KOHA Integrated library software. Data entry of library material is in progress. Our library has a collection of 193 rare books. Most of them were published about 100 years back. These books were getting damaged due to book warms and termite. The Library is trying to preserve these books with the help of National Archives of Pakistan. The old hand written spine labels of all the libraries of Da’wah Academy is replacing with computer printed spine labels. The re-classification of all the libraries material from local library scheme to Dewey Decimal Classification Scheme is under progress, to maintain the International library standard. 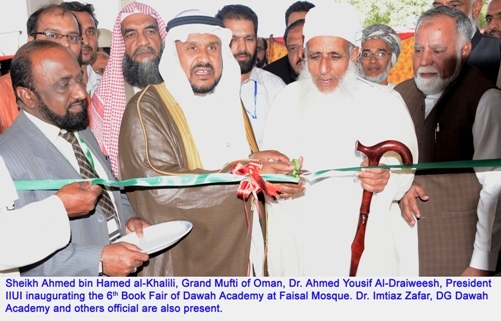 Da’wah Research Library conducted 6th Da’wah Book Fair in April 2015 more than 50 booksellers/publishers participated in the book fair. Da’wah Research Library is located at Faisal Masjid Campus, IIU Islamabad.